Preheat the oven to 350°. Coat a 9-inch loaf pan with cooking spray; line the bottom with parchment paper. In a skillet, cook the bacon over moderate heat until crispy, 8 to 10 minutes. Drain on paper towels. In a bowl, whisk the flour with the baking powder, cayenne and salt. In another bowl, whisk the eggs with the buttermilk, olive oil and mustard. Make a well in the center of the dry ingredients and stir in the egg mixture until just combined. Fold in the goat cheese, Parmigiano, olives, bacon, scallions, chile and thyme. Scrape the batter into the prepared loaf pan and smooth the surface. Bake the bread until golden on top and a toothpick inserted in the center comes out clean, 35 to 40 minutes. Let cool for 15 minutes, then run a knife around the loaf to loosen it from the pan. Invert onto a plate and let cool completely. Cut the loaf into thick slices and serve. The bread can be wrapped well in plastic wrap and refrigerated for 1 week. 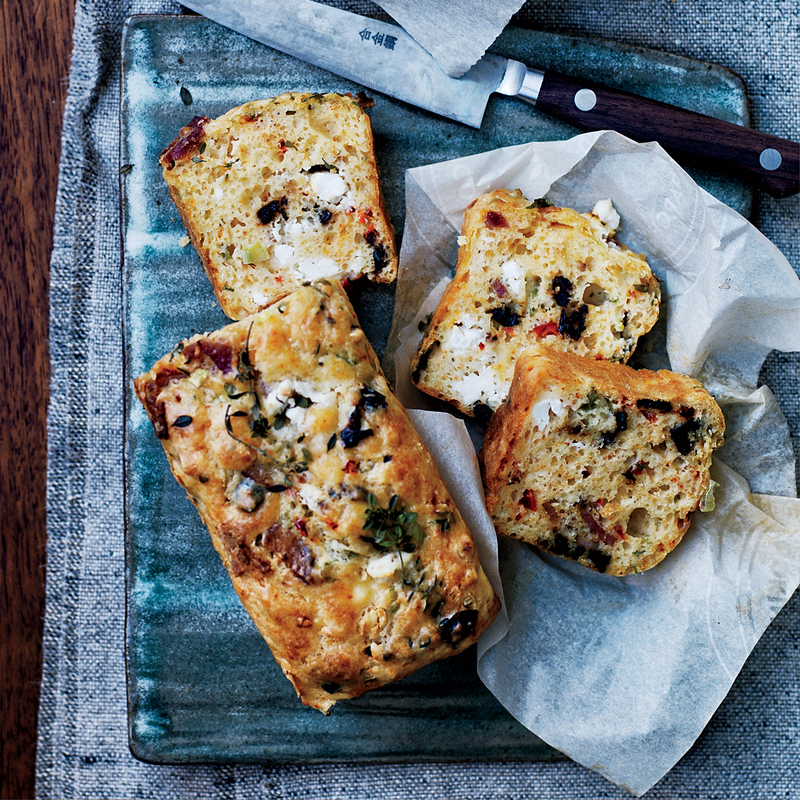 Review Body: We loved this savory quick bread when we made it in our kitchens here at Food & Wine. Review Body: I wonder if chives would also be a great addition on top of the bread? What do you think? This looks good! Review Body: The bread looks really delicious! This is perfect for my breakfast and will try this the soonest possible. That cheesy bread loaded with bacon, I just can't resist!! Review Body: I made this bread yesterday and it is almost gone. It is delicious! It was very easy to make. The one thing I would do when I make it again is not make the bacon pieces as small as the first time. The olive and goat cheese and spice flavors really come through. It is very decadent. Review Body: I've made this 7-8 times now. I've varied ingredients such as using 1 tbls sriracha instead of cayenne, added 1/4 cup chopped, sun-dried tomatoes, or 1/2 c toasted walnuts. I've changed to reflect flavors such as Mexican, Italian, and Asian. They have worked out great. It is a very versatile recipe. My favorite way to use it is as a base for poached or fried eggs. I made a tuna sandwich on it just yesterday. I'm a little obsessed. Review Body: All hail the bacon bread. All hail the bacon bread. Review Body: What a fabulous recipe! I must try it over the weekend. Can I use mozzarella cheese on top? Review Body: This looks absolutely scrumptous! I could eat the whole thing all day. I just love bacon, it's my favorite!